This 1934 MS-64 Washington Quarter Light Motto has a great strike and is full of luster. This is the more rare coin of the two!!!! 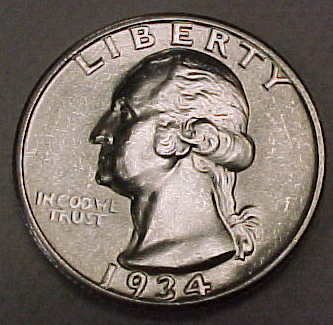 If it is still avaliable make sure to see the Strong Motto 1934-P. The coin pictured here is the ACTUAL coin that you will receive! Make sure to click below to see the reverse!